I have previously interviewed Gregory Dowling about Ascension, his historical mystery set in Venice. When I heard he had a new book out, I asked if we might speak about it. To sweeten the bait, I promised that I, for my part, would not indulge in another extended catfight about Byron. Graciously, Gregory agreed. His publishers kindly sent me the book, and I took it Venice to read – the perfect book for a rare day of dense rain gurgling down the drainpipes into pewter-grey canals. 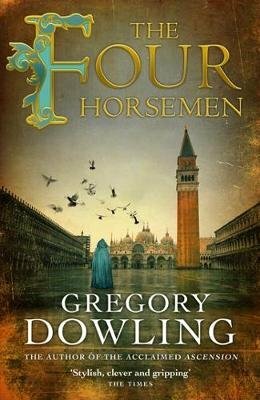 In The Four Horsemen, Gregory Dowling’s protagonist Alvise Marangon is set to investigate a secret society that has suddenly manifested unpleasantly with the murder of a scholar so eccentric and impoverished that it’s a mystery as to why he was worth killing at all. This novel is about spy-circles that overlap and clash. It is also about a clash of beliefs … the chief characters believe that Venice was either an Attila to the ancient of city of Constantinople, or the rightful heiress to its holy leadership. Some people believe in one or the other so strongly that they must murder, commission murder, or die. Alvise Marangon is one of those indispensable uncomfortable-in-his-own-skin characters. He straddles two worlds, being Venetian but brought up in England. He’s a cicerone, a learned guide to English Grand Tourists, so he knows the city inside out – a useful knowledge base for a novel about Venice recounted in the first person. The discomfort of Marangon’s position is that he is not quite one thing or the other. 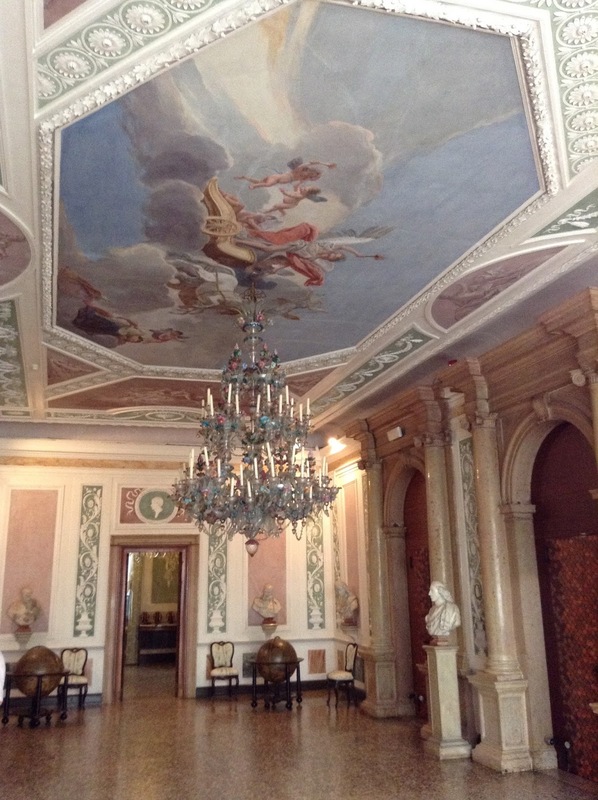 He’s a poor man who sometimes moves in the most elevated society and the most elegant of spaces, like the Querini Stampalia palace, pictured below. Alvise is clever, but not so clever as to evade a constant stream of deadly troubles. He is a last-minute merchant, an excellent device for keeping readers on the edges of their seats. being the son of an actress, his sense of theatre enlivens the novel. He’s endowed with a few failings, including an over-fondness of wine. And he indulges in one reprehensible moral lapse that I found shocking, mostly because I was so engaged with the character. A paid informer. Their reports can be found in the state archives and make fascinating if often depressing reading. A great deal of what one reads amounts to little more than local gossip, but (or perhaps “and so”) it helps to give one an idea of Venetian society. Alvise finds himself forced into this role. 2. As did one Giacomo Casanova, thirty years after your story. What about a ‘sbirro’? A law-enforcer at the humblest level; the term is almost always derogatory, as they were generally reputed to be corrupt and/or violent. 4. 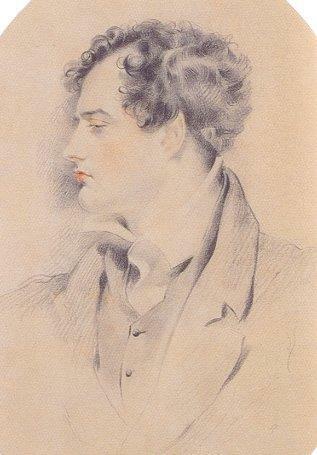 A 'cisisbeo' (without mentioning Byron, if possible, or just a little bit)? And carries fan and tippet, gloves, and shawl. Their system has it’s [sic] rules—and it’s fitnesses—and decorums—so as to be reduced to a kind of discipline—or game at hearts—which admits few deviations unless you wish to lose it.——They are extremely tenacious—and jealous as furies—not permitting their Lovers even to marry if they can help it—and keeping them always close to them in public as in private whenever they can.——In short they transfer marriage to adultery—and strike the not out of that commandment.—The reason is that they marry for their parents and love for themselves.—They exact fidelity from a lover as a debt of honour—while they pay the husband as a tradesman—that is not at all.—— You hear a person’s character—male or female—canvassed—not as depending on their conduct to their husbands or wives—but to their mistress or lover.——[…] It is to be observed that while they do all this—the greatest outward respect is to be paid to the husbands—and not only by the ladies—but by their Serventi—particularly if the husband serves no one himself (which is not often the case however) so that you would often suppose them relations—the Servente making the figure of one adopted into the family.—Sometimes the ladies run a little restive—and elope—or divide—or make a scene—but this is at starting generally—when they know no better—or when they fall in love with a foreigner—or some such anomaly—and is always reckoned unnecessary and extravagant. 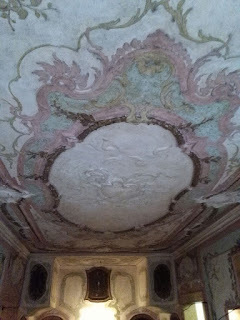 A room or set of rooms kept by Venetian men or women of high rank for purposes of pleasure; often but not always the pleasure consisted in games of chance (hence the modern meaning of the word), but a casino could also be used for sexual liaisons or just for refined conversation and social gatherings. Can you explain the background to your premise that Venice should be regarded as the end of Byzantium or the heiress to its spiritual hegemony? What kind of people would have espoused each of these views? Well, I wouldn’t say it is my premise but that of certain characters in the novel. Venice grew up in its early years in the shadow of Constantinople; it never fell under the aegis of the Holy Roman Empire of the West, precisely because it was under the protection of Constantinople. This gave it a certain independence as compared with other Italian cities and states. And then as it grew in wealth and power it came to rival Constantinople and this culminated in the Fourth Crusade, in which Venice led the assault on its old protector, sacking the city and basically assuming for itself the role that Constantinople had always had, as the leading power in the Eastern Mediterranean. One only has to look at the great paintings celebrating the event in the Doge’s Palace to see that this event was considered a foundational moment in Venetian history. Venice, which had no classical past, having been founded in the fifth century, now took upon itself the heritage of imperial Rome – with all the additional prestige conferred by the religious status of Constantinople, as the city created by the first Christian emperor. Of course, that is not how it was seen by victims of that assault – which is to say, by the Greek-speaking world of the Eastern Roman Empire, the inhabitants of which suddenly found themselves under the rule of the Franks and the Venetians. And so in the novel it is primarily the non-Venetian characters, specifically the Greeks, who bewail and fiercely resent the end of Constantinople – because the eventual fall of the city to the Turks in 1453 can also be attributed to the fatal weakening of the city in that Crusade two and half centuries earlier. Venice, so to speak, sowed the seeds of its own decline. And can you tell us how you use the symbolism of the four famous horses that can be seen in replica above the doors to the basilica of San Marco? (with the real ones safely inside) And how they relate to your story? The four horses are considered the greatest trophy looted from Constantinople. The general theory is that they once stood in the hippodrome of Constantinople, even though we have no definite evidence of this. The important thing is that they are clearly a symbol of Roman-ness (to translate the word romanità); it’s certainly difficult to see any religious symbolism in them, unless one drags up the idea of the Four Horsemen of the Apocalypse (obviously hinted at in my title), and so it may seem rather odd that they should have been placed on the front of Venice’s most important church. But, of course, they were a clear statement of Venice’s imperial ambitions; the city was thus proclaiming itself as having assumed the leadership of the Roman Empire of the East. It’s interesting that they came to be closely identified with Venetian power, so that in the fourteenth century a Genoese admiral, for example, talked about bridling the horses of St Mark, rather than taming the city’s winged lion. And about the association of the Venier family, from Venice’s Golden Book of nobles, with Venus? And how the birthplace of the goddess is transposed from one island to another? That was clearly just a piece of wishful or opportunistic etymology on the part of the family, wanting to justify their possession of the island of Kythira, birthplace of Venus. Cyprus, too, claims to be the birthplace of Venus (or Aphrodite). My knowledge of classical mythology is not extensive enough for me to make any pronouncements on this dispute. But it’s another example of how the interpretation of history and mythology depends very much on the intentions and desires of the interpreter. One thing Alvise learns from his experiences is a certain fundamental scepticism. The story focuses on outrages committed against ‘Turkish’ – Muslim – visitors to Venice. Were current East-West relations in your mind when writing this book? Yes, inevitably. Also because these relations are all part of a continuous history, which we really need to know. If George W. Bush had known a little more about such things then he might have avoided talking about the need for a new Crusade after 9/11. That is a word that has very different connotations, depending on which side of the great divide you are speaking from. 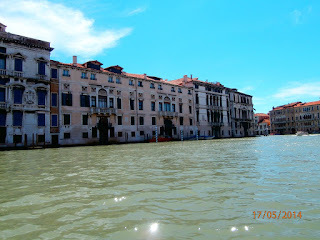 Having said that, there is no doubt that Venice played an important role as a bridge between these two worlds. To the great scandal of many in the Christian West, Venice continued to trade with the city of Constantinople, or Istanbul, as it would become, after it had fallen to the Turks. 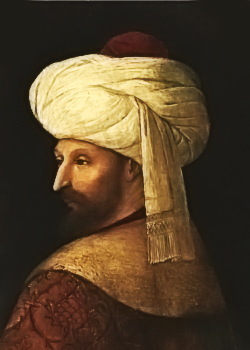 In the sixteenth century more than half of Venice’s grain came from lands under Ottoman rule. Sultan Mahomet II even invited the artist Gentile Bellini to his court, where he spent two years, which furnished him with exotic backgrounds for his paintings for years to come; it’s thank to him that we know what the Sultan looked like. (Something I've written about on this site). And just as Venice had been the first place in western Europe to adopt the Byzantine table-fork, so it became the first to start drinking Turkish “black water”, or coffee. One of your characters is a sexually rapacious noblewoman. I have heard it said that the 18th century was the most feminine of times – when women enjoyed more equality, freedom and power than at other periods. 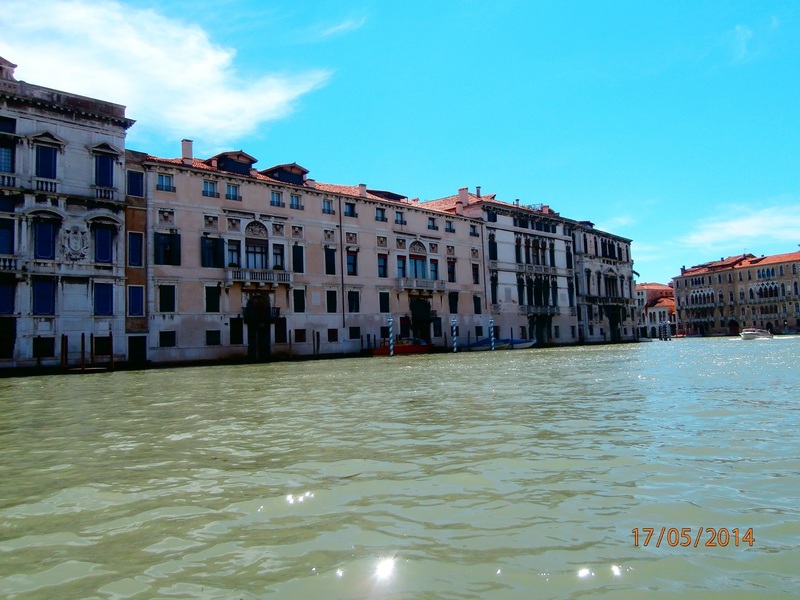 Is your Isabella Venier a metaphor for Venice of the 18th Century? Well, I don’t like to think of my characters purely in terms of metaphors or symbols. I hope she comes across first of all as a living, breathing person. Of course, there had been women of influence and prestige before the 18th century (Gaspara Stampa, Veronica Franco, Sarra Copia Sulam, to name just a few – and anyone who is interested should get hold of Kathleen Ann Gonzalez’s book A Beautiful Woman in Venice), but probably it did become easier for women, at least of a certain rank, to play a public role in the 18th century – and not only in Venice, of course. Under the circumstances, do you think readers will forgive Marangon for his lapse? I hope so. I can’t really say more than that. He certainly isn’t perfect and knows it. I see that this may not be the last Alvise Marangon mystery. Are you prepared to say more? The third mystery is under way. This time the Venetian scuole will come into the story – particularly the Scuola di Sant’Orsola, for which Carpaccio created the marvellous cycle of paintings now in the Accademia. Enlivened my bus journey to the station - and fed my fascination with a wonderful city and the dark, compulsive history of Europe. Thank you for this - another book for the Kindle!